While doing research for a paper in an entirely different class, I stumbled upon this journal; it’s available for perusal at www.multilingual-education.com and well worth checking out. It’s published by Springer as one of their many “open journals”; as such, it’s freely accessible to the public with no charge to read or download articles and no registration necessary to use the site. Instead, the journal runs on a “reverse business model”, with researchers paying a rather steep fee to have their articles published. The fee, it says, may be waived for researchers based in low-income countries, and is usually footed by academic institutions or private sponsors. Articles are peer-reviewed and must meet rigorous publication standards. It’s been published since 2011 and contains 5 issues with 33 articles. I’d certainly like to meet the Editor-in-Chief, Andy Kirkpatrick, a Professor of Linguistics at Griffith University in Australia. His areas of specialty are World Englishes (particularly Asian varieties) , English as a Lingua Franca, and contrastive Chinese-English discourse and pragmatics. In 2011, he, along with Merrill Swain and Jim Cummins, authored a book entitled How to Have a Guilt-Free Life. Using Cantonese in the English Classroom. He has an amazing and prolific beard. The Co-Editor, Bob Adamson, head of the Department of International Education and Lifelong Learning at the Hong Kong Institution of Education, has an impressive list of honors and publications. Sure, I’d like to meet him too, especially since he’s written fifty-plus English textbooks for primary and secondary schools in China. Writers of childrens’ textbooks are bound to be good conversationalists. Some of his interests include Comparative Education and Curriculum Studies. 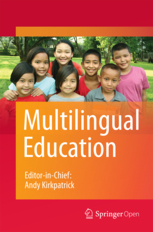 Multilingual Education is a high-quality journal that publishes empirical research on education in multilingual societies. The journal publishes research findings that in addition to providing descriptions of language learning, development and use in language contact and multilingual contexts, will shape language education policy and practices in multilingual societies. Multilingual Education is highly relevant to researchers in language and education, language education professionals, and policy makers. Who would this journal appeal to? In my opinion, a wide variety of people. As the mission statement makes clear, the articles published are empirical research, reflecting both qualitative and quantitative studies. However, an evening spent skimming through a variety of articles revealed that many of them would be approachable and appealing to academics outside the field of applied linguistics, and potentially to non-academic readers as well. Since education is a broad field encompassing sociocultural as well as academic issues, ethnographers, anthropologists, sociologists, and historians (or those with a general interest in any of those fields) would enjoy dipping into any one of the papers available for perusal. Geographers, too, might find this journal of interest; because the publication fee is waived for researchers from low-income countries, studies from places like South Sudan, Uganda, and Bangladesh are featured, which certainly whets my curiousity. One can travel to Paraguay, to Ghana, to Luxembourg, or Kenya, and get a glimpse of the context in which English is taught around the world. Since many of the studies are qualitative, readers can get an in-depth picture of the culture from scholars and practitioners living abroad doing longitudinal studies. What I’d like to read: Hmmmm. I’ve skimmed quite a few already, and am using one for a paper in my curriculum class. 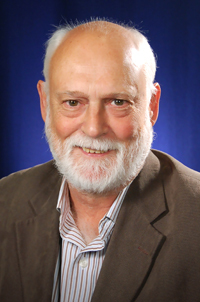 I certainly can’t resist a paper entitled Emotion-Based Language Instruction (EBLI) as a new perspective in bilingual education, co-authored by Bob Adamson, the journal editor. 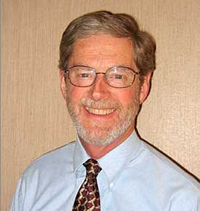 In this widely-viewed article, the authors propose a new approach to bilingual education based on the emotional qualities that learners bring from their L1 experience; Adamson’s unabashedly humanistic approach is based on the ideas of Stanley Greenspan, famous for a “floor time” therapy approach to treating children with autism spectrum disorders. I also wouldn’t mind digging into Marching is for soldiers: Russian-born Buriat children in a Chinese bilingual school, an ethnographic study focusing on the tension experienced by Buriat Mongolian children being schooled in a school system reflecting Han Chinese ideology. This longitudinal study, supported by data from interviews, casual conversations, and questionnaires, is packed with historical and geographic detail and looks to be a great read. Highly relevant empirical research with a global focus, and it’s all open access; why would I not recommend this journal? Check it out for yourself! Conceptualizer will get back to work on re-formulating the message. Merril Swain calls that “noticing the hole” in one’s own language production. It makes perfect sense, and we do it unconsciously all the time even as native speakers, especially when faced with the challenge of putting something very difficult or delicate into words. It doesn’t sound right to us or isn’t clear enough; we stop mid-sentence, go back and try again, creating a cycle in which output influences input. I must be getting academic-nerdy, because I find that really cool. So output influences input. By producing imperfect speech, language learners notice the holes in their own interlanguage (that special imperfect and constantly changing working model of the language being acquired) but they can’t yet do the repair work. That’s where interaction comes in. Perhaps the learner’s interlocutor (speech partner) is a native speaker, and consciously or unconsciously happens to use just the phrase that the learner has been struggling to produce. “Aha! That’s it!” says the learner to himself, assiduously comparing the correct version to his or her own imperfect one and plotting to produce the phrase correctly next time, gosh darn it. If context allows, the highly-motivated learner will bring the conversation to a screeching halt and try out the new phrase then and there, hopefully meeting with encouragement and kind words from the patient interlocutor. This, of course, is called “noticing the gap” (Schmidt, 1990), and the process is known as cognitive comparison. I’m sure that Brown’s students thought their teacher was awesome and inspired. And before I proceed any further, I’m not ashamed to admit that I too have a soft spot for this kind of model: it’s warm and nurturing, it’s visually appealing, and it’s more “likeable” than a flow chart featuring boxes with names that sound like cold, linguistic super-hero robots: Formulator smashes Conceptualizer! Articulator crushes Audition! Lexicon caught in the middle! Brown’s model, on the other hand, is mellow and groovy. But as much as the organic model appeals to my sense of aesthetics, it’s flawed for me, because, unlike the Levelt model, it’s not cyclical. Although this was a language acquisition model and Levelt’s was a model of speech production, I would argue that both the act of speaking and the act of acquiring language are cyclical in nature. According to Levelt, learners’ own output influences their input, and vice-versa. According to Brown, the seeds of language acquisition are sowed, watered, nurtured (and all those details are all right on the mark), and finally bear the “Fruit of Performance”, or output. What’s missing is that the leaves and fruits on the “Output Tree” need to fall to the ground, turn to compost, feed the roots of the tree, and produce still more output. 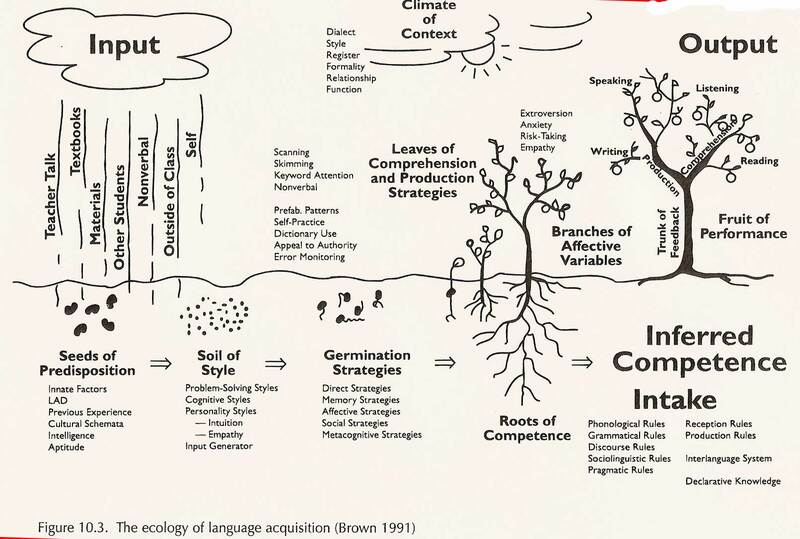 That could easily be taken care of by drawing a big old compost pile off to the right of the tree, but then what about the role of interaction in language acquisition? It appears that learner’s “production” doesn’t really mature until the end of the natural cycle, with no representation of interaction along the way or of attempts to use language imperfectly (hypothesizing how language works). I tried to think of how to re-work the model to include interaction, but the best I could do was to envision a flock of birds sitting on the tree branches, doing their best to act as interlocutors and spurring the buds on to full bloom. Aviary-locutors, in constant motion. Six short months ago, I might have been satisfied with the Brown model, so I guess that my education is progressing. That’s a good feeling: I found something cool on the internet, scrutinized it, compared it with the theories I’m learning and with another model, and found it sadly lacking. Although it’s not groovy, the Levelt model still comes out on top for me because it works so brilliantly, even as a model of first language acquisition. A bit of searching on the side reveals that it has been re-designed by Kees de Bott as a model for bilingual speakers….and I think I just may have found a good article to review in a future post. Stay tuned, and thank you for reading! Yesterday’s class marked the exit of the Ear Book ( too soon! ) and the end of the listening half of Dr. Jim’s course. It also marked the abrupt entrance of the trio Complexity, Accuracy, and Fluency, featuring three lengthy academic articles kicking off the speaking half of the course. Many of us were mentally unprepared for the switch, since we had spent the weekend studying for the Ear Book midterm exam rather than reading the articles. Half the class time was devoted to the test and the other half to article discussion, but since most of us had not been heroic enough to sacrifice our midterm test grade and wade through the readings, question time was short and sweet, and discussion nearly non-existent. I left class in a daze, telling myself I would read at least one of the three articles as penance, and write it up for my blog post. So now I’m bound to keep my word, and I’ve deliberately chosen the most formidable of the three: a 23 page treatise by Peter Skehan called “Modelling Second Language Performance: Integrating Complexity, Accuracy, Fluency, and Lexis”. I’m really a famous applied linguist. It’s not a catchy title and there is not a single picture in the article, which features page-long paragraphs and terms like “complexification”. The unwavering seriousness of the paper, in fact, led me on a short search, scouring the internet for photos or videos of Skehan which might reveal something about the man behind the scholar. 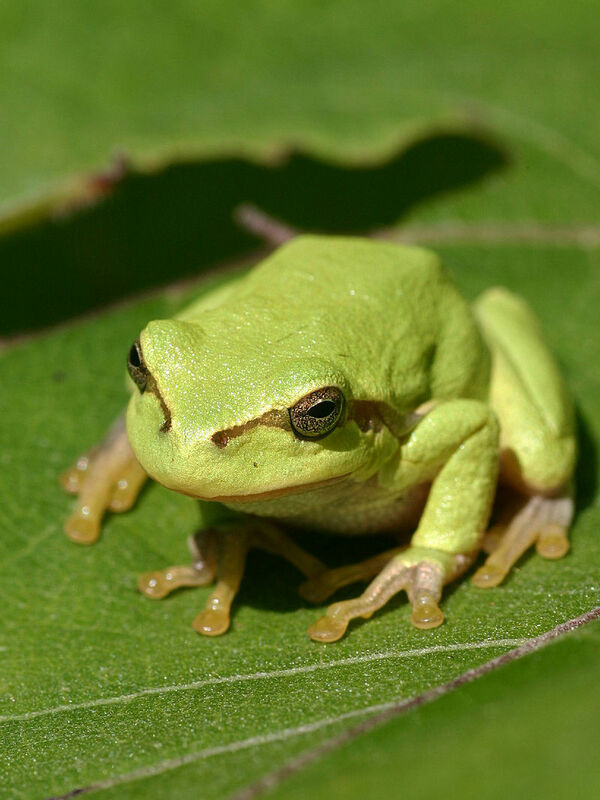 What I came up with was this: a single video, filmed last year at the University of London, in which Peter Skehan tells a joke aobut a voluptuous blonde and a frog. He says it’s the only joke he knows, and it turns out to be an applied linguistics joke. First one I’d ever heard, and I won’t spoil it for you–take a listen for yourself, here. Alright, now I will get down to business and wrestle this article into submission. The article deals with the tension between three aspects of speaking performance that are constantly competing for L2 learners’ attention and straining their cognitive resources: accuracy, fluency, and complexity. Accuracy, of course, refers to correct and error-free speech. Fluency refers to smoothness, flow, and ease of communication, and complexity refers to “advanced language”. The Trade-Off Hypothesis ( Skehan’s own hypothesis, which he defends in this paper ) states that L2 learners are severely taxed ( stressed, burdened, ) by the demands of these three competing processes, and find it difficult to perform well in all three areas simultaneously. This makes sense. All three areas require attention, and when learners are focusing intently on any one of the areas, their performance in the other two may suffer as a consequence. For instance, as a Japanese speaker, my grammar is fairly accurate and I can talk a mile a minute, but I also recognize that my general use of the language is not as complex as that of adult native Japanese speakers. If I aimed for complexity, I can easily imagine both my accuracy and my fluency suffering, along with my good humor and patience. In another often-quoted example, many serious Japanese students are sabotaged by their determination to speak accurately and to use complex words and phrases from their textbooks, leading to stop-and-start dysfluent speech. So we’ve established the problem of tension. There are other problems going on in this article, including a rival hypothesis (which I will not touch on here) and a rival academic who apparently referred to the Trade-Off Hypothesis as “vacuous”. Aside from these two hints of drama, this is a straightforward article, intending to better define the ongoing complexity-accuracy-fluency challenge, and to re-introduce a first language acquisition model, re-interpreted by Skehan for second language learners. Skehan proposes early on, in fact, that the complexity-accuracy-fluency trio should expand to a quartet, including lexis as a fourth aspect. Although this seems unnecessary, since Skehan himself has defined complexity as “advanced language”, he argues that second language learners could benefit from considering complexity in two parts, structure and lexis. In other words, he proposes redefining the performance aspects as complexity (of structure), accuracy, fluency, and lexis (complex or low-frequency words). This, he argues, is necessary because while native speakers who use “big words” are usually masters of grammar (the two correlate), the same is not true for second language speakers. Like the serious Japanese students previously mentioned, many L2 learners who attempt to use difficult words find their grammar derailed in the process. No-one wants their grammar train to be derailed, and if a greater focus on vocabulary in general (both low and high frequency words) can free up the speaker’s resources to attend more closely to accuracy and fluency, then I have no quarrel with Skehan on this point. Along with complexity, the concept of fluency should also be re-examined, says Skehan. And here I will include a link to something fun that arrived in my mailbox the other day from my friend Jase Levine, known as “Fluency MC”. Click on it to learn from 34 practitioners, materials developers, teacher trainers, and SLA researchers about fluency and how it can best be achieved. You’ll see that the concept of fluency is not so easily defined, and that even the experts disagree about how to become fluent. In this particular article, Skehan is interested in speech pauses (one of the most common dysfluencies), and presents evidence from his past publications showing that not only do non-native speakers pause more mid-speech, but that they pause in different places than native speakers. While native speakers naturally pause at the boundaries between clauses, L2 speakers also pause within clauses. As Skehan says, they “seem to have pauses thrust upon them” rather than initiating the pauses themselves. Interesting, eh? His point is that there are many dimensions to the aspect of fluency, and we should take care to define the concept itself thoughtfully and thoroughly. I won’t argue there, either. As I mentioned before, this was a long and complexified article; what I did not mention was that it led to the discovery of model of language production that I’d been unaware of: The Levelt Model of first language speaking, proposed by Willem Levelt in 1989. Here’s the model, featuring the three super-heros Conceptualizer, Formulator, and Articulator. 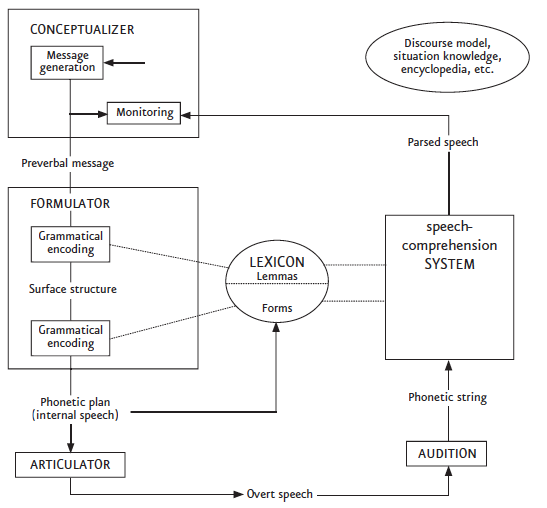 As you can see, according to Levelt, the Conceptualizer is where the language process starts, as the speaker’s message is generated. The Formulator is the “surface” of language production, where the grammar is put together (encoded) and prepared to be phonetically implemented. The Articulator, of course, is the hero who gets to actually “speak” and send the message off to be processed by the listener. Learners: Help, help! We have a task! We have to plan! This stuff is abstract, and the information keeps changing! We can’t deal with all the information! Skehan’s advice: Buck up! You are dealing with complexity. Your Conceptualizers are stressed. Learners: Help, help! We can’t remember all these big words! And we have to use them–there’s no choice! Skehan’s advice: Well, well, now. Your Formulators are experiencing some pressure. Try to be patient. Learners: Heeeelp! We’ve got to finish this task in five minutes! And there’s SO MUCH! And there are no fun conversations! Skehan: Aaah, well, that would be pressure on your Formulators again. Let’s see what we can do about this…. And then Skehan offers practical advice. Here’s what can be done when learners’ Conceptualizers are under strain, and when their Formulators cease to formulate smoothly. To begin with, the goal is to decrease pressure on both the Conceptualizer (the Information Guy, whose job is to prime the Formulator so that lexis can be more easily retrieved) and the Formulator (the Planner, who accesses the words and generates the message to be articulated). A clever teacher can arrange and adjuste learners’ tasks to ease the burdens of both. To placate the Conceptualizer, then, design tasks with concrete, static information--less is more. And keep it simple, so the learner feels grounded rather than overwhelmed. For the Formulator, Skehan suggests that teachers do the basic planning so that students can limit their focus to the task itself. Dialogs, he says, are less overwhelming than monologues. With these two factors addressed, Skehan proposes that the Formulator will be able to access difficult lexis more efficiently. Lastly, the Formulator is concerned with syntax–which means grammar–which refers to the Accuracy component of the troubled CAF trio (or the quarrelling quartet if you include Lexis). Here the task-based solution would be rehearsals. And tight structure. Lastly, more dialogues and a post-task activity will allow students to polish what they have learned in the task, thus improving their accuracy. Well. Since this is a blog post and not a literature review, I can now bring this entry to a close in all good conscience. This is not the entirety of Skehan’s message, or even the essence of his message in a nutshell; it’s what I personally gleaned from the article, and what I hope might be interesting and inspiring to others. And if any of you reading are considering a graduate degree in TESOL, I urge you not to be afraid of Peter Skehan and his page-long paragraphs. Dig right in, break down the academic vocabulary, and find the heart of the ideas. It’ll be worth your time. Journal: Cerbral Cortex, September, 2013. Authors: François Clément, Julie Chobert, Mireille Besson, Daniele Schön. Purpose: To examine the influence of music training on speech segmentation in eight year old children. Procedure: The tested children were pseudo-randomly assigned to either a music or a painting group, and given two years of training. They were tested before training, at one year, and after two years on their ability to extract words from a continuous flow of nonsense syllables. Results: Researchers found improved speech segmentation skills for the musically trained group only. My thoughts on the article: First of all, let me say that is an article about a subject whose surface I am just beginning to scratch and probably will never fully comprehend; nevertheless, I am fascinated by the work of these French researchers who have been exploring the interrelation of music and speech for many years. They have developed an artificial language, which they revise and use in different ways to determine how humans learn to distinguish words from continuous speech. The language is syllabic, with a fixed number of nonsense syllables which are arranged into “words”, with each word consisting of precisely three syllables. The words have been assigned tones, which are used consistently throughout experiments, and sung by a synthesizer in a continuous stream, ( in varying order ) with no breaks between words to establish segmentation. With no audible segmentation and no semantic cues, how on earth would a listener recognize words in a garbled stream of “gysigipygygisisipysypymi”? According to the researchers’ conclusion, participants are able to perceive words through the integration of pitch with the statistical properties of the speech structure. Let me explain further. The researchers’ artificial language possesses certain statistical properties: namely, in a continuous stream of speech with words in random order, syllables that appear next to each other within words will occur together more frequently than syllables that are separated by word boundaries. This is called “transitional probabilities”, and it is true for tones as well. In the words Gy-si-gi and Py-gy-gi ( for example) “si” and “gi” will occur together more often than “gi” and “Py”. So theoretically, listeners’ brains could come to recognize syllabic patterns that occur more frequently. Still, it is dubious how accurately a listener could guess, and indeed previous research showed that this was a difficult task to achieve when the continuous stream of speech was spoken, rather than sung.However, Clément et al have found that accuracy increases when the continuous stream of speech is sung rather than spoken. When listeners associate a certain syllable with a pitch (or tone), they can follow the melodic contour and unconsciously remember as “words” those frequently occurring syllable sequences. Thirty-seven 8 year old native French speaking school children were divided into two groups: a music group and a painting group, with care taken to ensure that children from each group represented similar socioeconomic backgrounds, and that no child had previous experience with either music or painting. Along the way, children either moved or had problems with attentiveness and the number of participants shrank to twenty four. The children were tested at the beginning of the experiment by entering a private booth and listening to the stream of sung speech. They were then presented with pairs of spoken words, one of which was an actual “word” from the artificial language, and the other a “non-word” created from the last syllable of a word combined with the first two syllables of another word, or vice-versa. Children were to decide which of the two “words” sounded familiar, based on the sung speech they had just heard. After this initial test, the two groups began two years of lessons. The music group had 45 minute lessons twice a week during the first year, and once a week during the second. The painting group also had 45 minute lessons, and followed the same pattern. 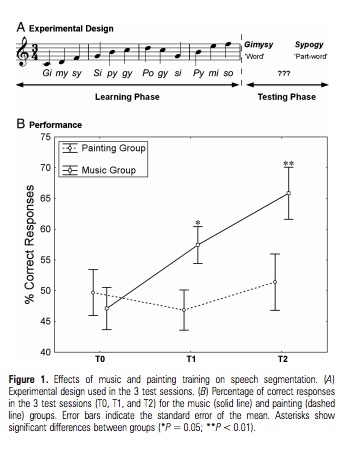 After the end of the first year, the two groups were tested again, and the results showed that the music group had improved in their ability to recognize the “familiar” words, while the painting group’s ability had actually decreased. At the end of two years, the music group showed yet another jump in performance, and the painting group’s performance also increased, although it hardly varied from the score they achieved two years before, which was deemed at “chance level”. Take a look at the following graph: the solid line shows the number of correct responses given by the music group over the two year period, while the dotted line shows the painting group’s lack of progress. You can also see the alignment of pitch and syllables, and imagine what a strange experience it must have been for eight year old children to listen to this, alone in a sound booth. The researchers were particularly interested that the children from the music group were impressively accurate in distinguishing “words” even though the continuous sung sequence was actually designed to contain a higher percentage of “non-words”. The graph on the left shows the progress of the music group compared to the painting group at the one year mark, but after two years, the music group’s percentage of correct responses actually increased to nearly 75% ! Allow me to add that exclamation mark, since this is not a formal paper and I personally find that amazing. Having had years of piano lessons as well as music theory and music appreciation classes, I would love to volunteer in just such a study, especially if it involved more free music lessons! And it’s not the kind of comment that one includes in formal article reviews, but hey: those kids lucked out. They got two years of training in skills that fostered their creativity and ( I am certain, though I cannot prove it empirically ) made them happier, more interesting individuals. I only hope that the children in the two groups didn’t know the study results; I would hate to have the painting kids think of themselves as losers who got “the wrong answers”. As long as this was not the case, then the painting kids absolutely lucked out too, with free painting lessons. Aside from the creepiness of listening to strange syllabic sequences by oneself in a booth, this was a win-win situation for the children, and I hope their parents appreciated the opportunity. Finally, the researchers conclude their study with confident pronouncements: musically trained children are able to successfully determine word boundaries, showing that music can indeed play an important role in language acquisition. And I believe so, too. Yes, music is fun and motivating for language students, but its influence is much deeper. I look forward to following the further adventures of these French cognitive scientists and to reading about other cutting edge research related to the music/speech connection. Dr. Jim’s speaking and listening class covered two full chapters of the Ear book this evening; discussion time was generally lively–sometimes bordering on boisterous but never actually crossing that delicate line–and marked by moments of enlightenment, when some concept was either finally understood or found to bear some personal meaning for one of the group. Tonight “my group” was Chunmei ( from Taiwan ), Alan ( from China ), Yae ( from England and Japan ) , Tokiko ( from Japan ) and me ( from the U.S. ). Hiroko ( in the picture below ) was in the group at the next table, but I wanted to show her bright smile here anyway. 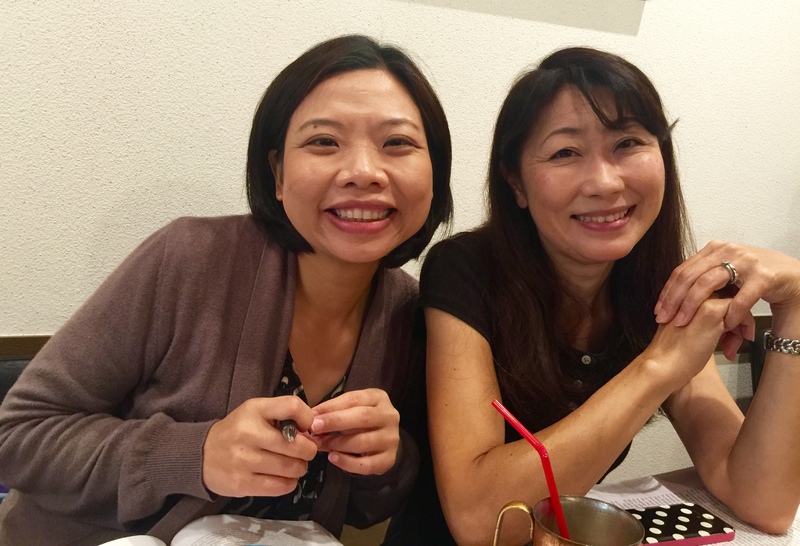 Chunmei and Hiroko keep discussion lively in Dr. Jim’s class. We had been plowing through different listening-related concepts and negotiating for meaning with mixed success, when near the end of class we hit on an interesting phenomenon that was directly related to the topic of the hour: assessment. I’d like to elaborate on the interesting conversation that ensued, but first, let me activate your schemata and talk a little bit about assessment. We encounter it on a daily basis: our health is assessed by doctors, our cars are assessed by mechanics, our financial situation is assessed by city officials ( who will tax us accordingly ), our skin type is assessed by flawlessly groomed saleswomen ( who will sell us the appropriate beauty cream ), situations are assessed, damages are assessed, our personalities are assessed, and so on. Assessment can be objective ( hopefully your doctor will do a thorough and professional examination before he pronounces you either ill or healthy ) or highly subjective ( say you poke your head into a restaurant, assess the atmosphere, and quickly decide it’s not for you, based on the feel of the place ), and either method of assessment can be valid, depending on the context. So let’s talk about assessing second language learners, and why it’s such a tricky business. First of all, assessment involves judgement, and judgement implies consequences. The results of high stakes tests ( such as SAT and GRE exams, or TOEFL and TOEIC exams ) can decide learners’ educational or career paths, and the fair and accurate assessment of the exams is a huge–I would say grave–responsibility. At least once a year in Japan, there is a testing scandal involving students who actually pass their high school or college entrance exams, but are denied admittance. After the fact, it is discovered that the tests results had been wrongly calculated ( and the average listener never learns whether this was an accident or a deliberate mistake ), apologies are extended, and appropriate punishment is meted out. Again, the average listener never learns what happened to the ill-fated student in the end. I always wonder where they end up, and what kind of emotional baggage they’re saddled with as a result of the “mistake”. Think about those four components ( appropriateness, accuracy, fluency, and understanding ) and what they mean for a second language learner. Accuracy, understanding, and fluency are, to me, are more straightforward than appropriateness, since the latter involves pragmatics, which is never straightforward. Some who define fluency as not just speed and facility of production but as “natural use of language” also include an element of pragmatics there as well. Here is where the class became interesting, as our group exchanged stories and gave some thought to the issue of pragmatics and assessment. The first story that surfaced was my own, and here it is. Eight years ago, I received a call from a friend who had a part-time job with a testing company ( to my dismay, I cannot remember the name of his employer, but perhaps that’s for the best ). His mission was to track down Japanese speakers who would potentially fit the “top band” of his company’s speaking proficiency standard chart, interview them, and submit the results for assessment. The company was in the process of re-evaluating their standards and looking to see if, in fact, those standards were realistic for Japan. “How about your husband? Do you think he’s proficient enough? Would he do an interview?” my friend asked me with some hesitation. “Well, sure!” I said confidently, with all the faith in the world that my clever husband would ace the interview. My husband, one of those rare people who likes tests, was immediately agreeable, and the three of us met at my school on the appointed day. The first half of the test went smoothly, as the questions were fairly innocuous. My husband was in his element, speaking confidently and accurately, and I was sure he’d pass with flying colors. My clever husband, and clever me, to have found and married such a clever man! But then–but then–my friend the tester threw a curve ball. “Here’s the situation,” he said. “I’m your co-worker and friend, and I have a smoking problem. It really bothers you. I want you to convince me to stop smoking.” And everything fell apart. My husband is Japanese. Smoking was still not politically incorrect eight years ago in Japan, and even if it had been, one’s habits in this country are one’s own business. The workplace is not where men have heart-to-heart talks about alcohol or smoking habits. Most men here don’t have those talks anyway! I knew instinctively that things were not going to go well with this question, and I was dead right. My husband very compliantly said a few words, smiled, and dropped the ball. “No, no! Pick it up again! Don’t stop there, be persuasive! !” I thought, burning inside. The interviewer was encouraging: “Oh, you can come at me stronger than that! The smoking really bothers you–come on!” But to no avail. At that point, my husband capitulated completely, proposing ( while still smiling politely ) that if the smoker really wanted to smoke it was okay, and he wouldn’t bother him anymore. And that was that. The interview ended, we ate a box of donuts together, and talked about our respective families. My friend called some weeks later to report that my husband had not fit the criteria for the top band of proficiency. And it was because of the smoking question. “He just didn’t use the language like a native speaker,” was the way my friend explained it. As I understood it, then, he didn’t use his English appropriately. And yet the problem was not my husband’s English skill. The problem was that he was put in the uncomfortable position of engaging in a culturally unnatural and unfamiliar type of discourse. He was sideswiped by his cultural identity rather than his lack of vocabulary, fluency, or comprehension. Literally left tongue-tied. Too bad, I say, but at least the situation was voluntary, with no “high stakes” involved. Not counting, of course, my husband’s pride and my own high expectations. As soon as I had finished my story, Chunmei chimed in with her own. “I can never get my students to do role plays about smoking, either!” she exclaimed. “I ask them to persuade me to stop smoking and they clam right up and give me a funny look!” We then agreed that skipping the role play ( the book lesson ) and getting students involved in a discussion about the topic would be much more valuable. And we wondered about pragmatics and assessment. In the case of my husband, meeting the criteria for a “top level of proficiency” required him to behave in a decidedly un-Japanese way. He was judged to be a non-native level English language speaker because his reactions were Japanese. And this, of course, is the heart of the matter: is such a language proficiency assessment valid? Recall the IELTS Band 9 criteria: appropriateness, accuracy, fluency, and comprehension. Again, “appropriateness” is the tricky component, and ( according to my friend ) it was a component of the test my husband took as well. As I see it, his approach to the smoking question was perfectly appropriate within his own culture. The interviewer did not specifically say, “You’re in the U.S. Address this situation like an American!” Of course, if he had, it might not have made much difference in my husband’s answer, but at least the expectation or the context might have been clearer. And perhaps, given the ambiguity of the question and the informality of the interview in general, the problem was one of reliability rather than validity. The Ear Book (chapter 10 ) presents a chart of assessment models that I found both interesting and enlightening. Specifically, Rost gives a visual overview of criteria for assessment according to the purpose of second language learning ( EFL vs ESL vs English for Young Learners vs English as a Lingua Franca ). According to this chart, my husband could probably get top scores in an assessment of English as a Lingua Franca, since this is the only category that specifies “expected to maintain national identity through English”. Still, if not for the pragmatic component, I believe he would qualify as a top-level speaker in an ESL assessment as well. So what’s the moral of the story? I really don’t know. I consider my husband a native-level English speaker, but that’s my own subjective assessment. In the long run, I’m engaged in an ongoing attempt to understand the delicate balance between mastering a second language ( which means tackling the pragmatics and taking on a new identity ) and retaining the foundations of one’s own cultural identity at the same time. Happily, there’s no rush, because I think I’ll be busy with this one for some time to come. “My child is only learning words–just words. How do I know that he or she is really learning to speak English?” I sometimes hear this concern from mothers of very young students in my private language school. Though it is hard not to feel defensive or anxious myself, I explain that their children are, in fact, doing their best to communicate in a manner that is appropriate to preschoolers. Their children know many words and chunks of language which they use to communicate in an abbreviated fashion, and this is normal. They are actually “speaking English” already. Most students will put their words together to form longer and more “correct” strings of language when they are developmentally ready, when they are motivated to do so, and when the timing is right. Some of them, unfortunately, will not. For now, they all know many, many words. I am always patient and reassuring when dealing with parents, but sometimes what I really want to say is, “What do you mean, JUST WORDS?” Knowing words is a very big deal, and not just for me personally. In the field of linguistics, scholars have devoted their lives to and built their reputations on vocabulary acquisition research. Chapter eight of the Ear book contains a whole section on vocabulary and how absolutely essential it is for listening comprehension, so that will be the topic of today’s blog post: how knowing a word intimately can make you a better listener. Let’s begin by considering the quantitative aspect of vocabulary acquisition: corpus linguistics studies show that to understand an everyday conversation, we need to know at least 3,000 word families. But on the other hand, and this is the most interesting part for TESOL students, there is the qualitative aspect: how deeply do you know those same words? This is called depth of vocabulary knowledge, and it affects the saliency of words in our mind ( obviously, the deeper we know a word, the better it sticks ) and our ability to use them appropriately in their correct context ( pragmatics again ). Let’s talk about knowing a word intimately. First, you need to recognize it when you hear it ( my four year old pre-readers are at this stage ). Some would even argue that true aural recognition would include hearing the word spoken in a variety of different accents. And then there is the problem of recognizing the same word as part of a spoken phrase, since issues like segmentation ( word boundaries ) and elision ( the omission of sounds ) come into play, adding to the learner’s already heavy cognitive load. A word may have an unfamiliar contracted version ( for instance “until” and “till” ) as well. And–just to make things trickier–there are plenty of homonyms: words with the same pronunciation but bearing a different meaning. Serious learners had better be familiar with those, too, or who knows what misunderstandings might ensue. Enough of the aural challenges of knowing a word–let’s move onto recognizing it visually. Is that really so important for listening? I know that it is for me; there are many Japanese words that I know only “by sound”, never having seen them in writing, and I cannot seem to consistently catch them in conversation. As my friends and fellow students will tell you, I am a visually oriented person, and without seeing a word in print, it simply is not salient enough for me. While some learners might be satisfied with only an aural level of “knowing”, learners like myself realize that knowing the spelling of a word and recognizing it swiftly in print gives them a more solid foundation. And so, the formal study of spelling is part of most second language learners’ agendas. Certainly those receiving formal classroom instruction cannot avoid it. In order to appreciate the challenge that L2 learners face, let’s begin by considering the problem of spelling from the native speaker’s perspective. While many native English speakers are actually poor spellers, they usually recognize in print the same words they cannot spell in an essay. Those native speakers who read widely as children often instinctively know how many words are spelled, simply from the hours of time spent in contact with the written language. Most second language learners, however, with no instinct to rely on or exposure to English books in their childhood, must wade into the muddy waters of orthography. Just how muddy are the waters? Look at the top half of the print below, which shows five different spelling combinations representing the same sound. L2 learners struggle not just to spell words, but to recognize them in print. Learning words with similar spelling patterns together is one way of tackling the subject. And speaking of grammar, knowing a word’s grammatical function is part of knowing that word deeply. Second language learners explicitly learn not just content words (nouns, verbs, adjectives and adverbs ) but the trickier function words ( those shorter bits of language that connect with content words to further clarify meaning ) as well. Along with this comes word order, which is instinctively recognized by native speakers, but often different from the L2 learner’s own mother tongue. In short, it’s an exhaustive and often frustrating process to formally learn grammar…..but the benefits are undeniable, and they greatly ease the listener’s mental processing of speech. Here’s how it works, in a nutshell: As the L2 learner listens, his or her brain busily constructs a rough grammatical framework ( as Rost explains it ) and fits the recognizable elements of speech into that framework, comparing them with semantic and morphological cues to establish meaning. In cases where precise understanding is necessary, the brain will actually sort through individual heard utterances, sorting them into appropriate categories, dividing content and function words and checking for things like word order and subject-verb agreement. Of course, not everyone who speaks a second language has formally studied its grammar, and from what we’ve learned in class in the past five months, this is often reflected in their speech which, although communicative and comprehensible, is often riddled with errors. The point is that part of knowing a word is knowing its grammatical function, which allows us to both use the word correctly in speech and to identify and process it swiftly when we hear it. And then there are collocations! What words frequently occur in combination with the target word, and is the second language learner able to recognize the same word when it’s embedded in chunk of language? Take the word “take”, which is my favorite example. Literally, according to the Oxford Dictionary of English, the most common meaning is “to lay hold of (something ) with one’s hands”. And then the fun starts, as students learn the million-and-one collocations that have nothing to do with the laying on of hands: take a bath, take a bus, take a test, take a trip, take a nap, take your time, take it easy, take a hike!, take care, take off, take in, take out, etc. etc. I was tempted to write “as students struggle to learn,” but actually, collocations don’t have to be a struggle. Of course, you can still buy serious books featuring exhaustive lists of collocations and idioms ( my Japanese husband bought plenty in his quest to master the English language ), but the world of online learning has other engaging and relevant resources for students who are motivated to search and teachers who are motivated to experiment with them in class. Collocations are chunks, they have rhythm and meaning, and the more you use them, the more salient they become. Take a listen to my friend Jase Levine ( a.k.a. Fluency MC ) who has literally made a career out of collocations. Students around the world find his chants highly motivating and just plain fun. It’s learning, Krashen-style: relax, enjoy, and acquire, rather than sweat and memorize. So what else is there to knowing a word intimately? Learners should be aware of a word’s frequency in usage, especially in Asian countries where exam systems require students to memorize scores of very low-frequency academic words at the expense of “easier” but very high frequency ( i.e. commonly used ) words. Unless a learner has a specific need for difficult and rarely used vocabulary, they are better off spending their energy with the most frequently used words that will allow them to function communicatively outside of their own language community. Language students can now plug words into a corpus analysis tool and immediately see their frequency as well as their family and collocates. Like Fluency MC and his collo videos, corpus analysis tools are fun ( you’ll be mesmerized once you figure out how they work ) and useful, both for second language learners and native speakers as well. 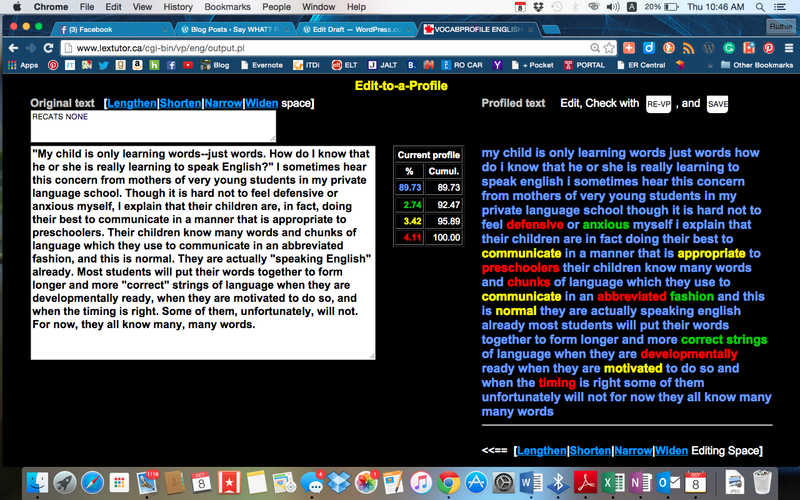 Here’s a screenshot of a lexical analysis of the first paragraph of this blog post. The words in blue are all high frequency, found on the 1,000 most frequently used ( written, not spoken ) words list. Those in red occur so infrequently they are considered “off-list” words. Sometimes the results of an analysis can be surprising: apparently no-one writes about preschoolers? Maybe they write about pre-schoolers. : ) And no-one writes about “chunks”? No-one writes about timing? At any rate ( and most importantly ), this particular analysis shows that the words I’ve used in my blog are 89.7 % high frequency words, meaning that this post should be accessable to the average Joe, or even to a diligent second language student. I hope so. Analysis of spoken language is a still different matter, and even more relevant to the process of listening. Read about the compilation of a corpus of 100 million spoken words and its ongoing analysis here–it’s good stuff. Let’s recap: to know a word intimately involves recognizing it aurally ( catching it in speech, in spite of accent or phonological variations ) and visually ( being able to read it automatically in spite of its seemingly irrational spelling ), knowing it’s syntactic function, its collocates, and the frequency of its use in both written or spoken language. There are also synonyms and antonyms, denotations and connotations ( slim has a more positive connotation than skinny, for instance ), and pragmatic restrictions. Many years ago, I remember our family wincing when my host sister Anja from Germany said matter-of-factly, “Give me the butter”–a direct translation from German, and not meant to be rude, but certainly not an acceptable use of “give” in a dinnertime context. We taught her, “Pass the salt, please,” laughed about it together, and she learned fast. All these aspects of vocabulary combine to form recognition vocabulary: words that are firmly ensconsed in the learner’s mental lexicon and easily accessed and processed in real time listening. So when students study a “word list”, remember the terms successfully, and score well on a test the next week, there’s a good chance that they haven’t learned the words at all. A post-test two weeks later would reveal that unless those words were used after the test in class, frequently and in a variety of meaningful ways, students would not be able to duplicate their former stellar scores. And even if they could, choosing correctly on a test shows that students recognize a word as it is used in that specific instance, not necessarily in other ( i.e. spontaneous communicative ) situations. Needless to say, because the word would not yet be salient enough, students might not recognize it in speech, either, no matter how clear their native teacher’s pronunciation might be. Got the point? Knowing a word intimately is no easy task, but discovering words in depth, rather than breadth, is also infinitely more rewarding than memorizing definitions. You think your child is learning “just words” then? Think again. They’re building the framework for a house that will hopefully last a lifetime. Stop worrying! Either lend a hand in the construction, or step out of the way and let them get to it.